Winery Doja was created of love… love towards wine and heritage. Our idea is simple - with lots of love we want to keep family tradition of vinegrowing and winemaking in Toplica region. Experience and know-how of our team help us make premium quality wine while keeping the authentic of Toplica terroir. 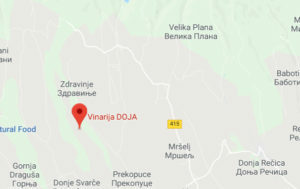 Doja is family owned winery with long tradition of vinegrowing and winemaking dating back ever since 1895., located on the slopes of the mountain Jastrebac with altitude of 470m. The specific climate with difference between day and night temperature up to 15 degrees in ripening period, makes Toplica region so unique and interesting. Varieties planted for making white wines are Chardonnay, Pinot Grigio, Tamjanika and for red varieties are Prokupac, Cabernet Sauvignon and Merlot. Most planted is indigenous variety Prokupac which is a symbol of Serbian winemaking. It is only one of few Serbian indigenous varieties and it creedal is located right here in Toplica region. Our goal and mission is to keep family tradition of making authentic wines from this region. Situated in the vineyards, there is winery with capacity of 200 000 liters. The winery is equipped with the latest technology for achieving premium quality. The whole process of making wines, from vineyard management, harvest, cellar management, aging, bottling and labeling is done in the winery. The wine story of the DOJA winery is rounded up in a tasting hall, located in the heart of the vineyard. In a warm wine setting, from which a unique view of the vineyards of the Toplica basin and the peaks of Kopaonik mountain in the distance, the enjoyment in wines gets an additional dimension. If you want to experience them in the right way and to get to know the authenticity of Prokupac Vineyard, the DOJA Winery provides you with hospitality throughout the whole year. The idea of ​​a gentle wine with strong character from indigenous Serbian variety Prokupac has long been present in the thoughts, plans and desires of Goran I Slavica Todić. The intentions started to be realized in 2010 by raising new vineyards of the Prokupac variety. And such intentions gave this result. Doja Prokupac is a sincere wine with character. Traditionally but modern, strong and gentle, serious and easy drinkable. Doja Prokupac is characterized by an intense ruby ​​color, the scents of red berry fruit covered with barique tones. The wine was aged in a barrels, and it has a moderate fullness, a good structure and a gentle finish. Open the bottle of Doja Prokupac and see for yourself - there's everything you need to know about Prokupac.